You will either be collected at Jomo Kenyatta International Airport or if you have arrived earlier from your Nairobi Hotel and transferred to Wilson Airport for your flight at 10:00 am to Naboisho. It is a beautiful flight passing over the fertile Kikuyu Highlands before reaching the Great Rift Valley. You will fly across the volcano studded floor of the Rift before reaching the Loita Hills and Naboisho Air strip. You will be met by your guide and there will be an hour’s drive to camp. 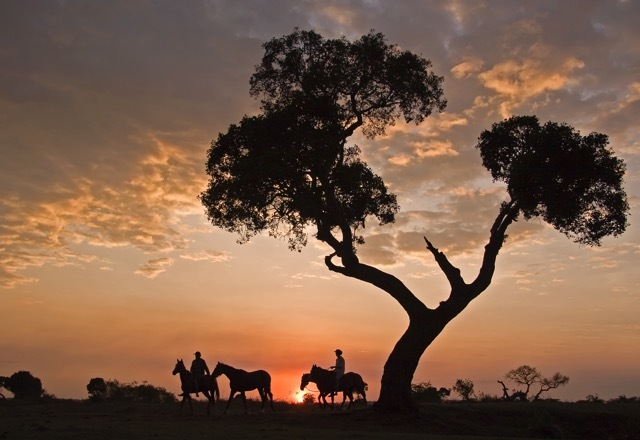 We reach our camp in a grove of acacia trees by a small stream at the southern edge of the Loita Plains at Olare Lamun (the rhino salt lick) Lunch will be served and you will have a little time to relax before meeting your horses and setting off on your first gentle evening ride. After an early morning ride we will come back to camp for a light breakfast and then set out for a game drive and walk up a hill nearby called Oloiburmut returning to camp for a brunch/lunch. There will be time for a siesta and at around 4pm we will drive up the hill to visit the local Masai Village. Our first moving day and we break camp in good time as it is the longest ride of the trip covering nearly 50kms. We will meet the vehicles to break the ride with a picnic breakfast and lunch along the way. Riding across the rolling open plains the game generally becomes more plentiful as we approach the Mara ecosystem. We should see herds of zebra, topi, giraffe, wildebeest, gazelle and there is a good chance of seeing elephant and buffalo as well. We reach our camp on the edge of the Masai Mara Game Reserve on the Olare Orok lugga late afternoon. From camp we are likely to hear lion and hyena at night and the abundance of game is apparent everywhere. A full day of morning and evening rides from camp with the option of driving into the game park for some good photographic opportunities. From the landrovers we can get much closer to lion, elephant and buffalo than we are able to do from the horses. Our second moving day; we head west across the Mara plains and reach the Mara River on the Park boundary. We hopefully ford the river (unless in complete flood) at one of the famous wildebeest crossings and then head south-west across the Mara Triangle where we have our picnic lunch before ascending the Soit Olololol Escarpment to reach our camp in a forest glade overlooking the whole Mara ecosystem. Today we will descend the escarpment again and ride through the Triangle once more to the same wildebeest crossing on the river. We head in a North Westerly direction and after a picnic lunch we find our final campsite set up on the banks of the Mara River. Close by there are some hippo pools and their grunting at night is a special feature of this camp. With a full day camped on the river we will follow the same morning and evening ride routine and often take the opportunity to cross the river close to the hippo which is an exhilarating a highlight. A walk or drive will be on offer after breakfast; providing another good opportunity to take photographs. 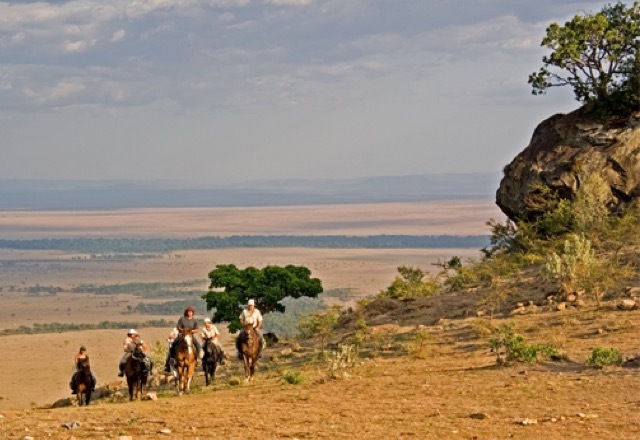 We will have a final early morning ride before breakfast and after saying goodbye to your horses we will drive to the airstrip to meet your flight back to Nairobi at around 11am in time to do some shopping in town and relax before your evening flight or in good time to reach your onward destination.